The Rio Grande Valley lies in the southern most area of Texas where it borders Mexico. The plants native to the Rio Grande Valley share drought and heat tolerance. Brush covers much of the native landscape and trees rarely exceed 30 feet tall. An estimated 1,200 native flowering plant species grow in the Lower Rio Grande Valley. Flowering shrubs and cacti provide seasonal color. The rough landscape offers sanctuary to wildlife, including thousands of migratory birds and butterflies that transit Texas on their way to winter in Mexico. 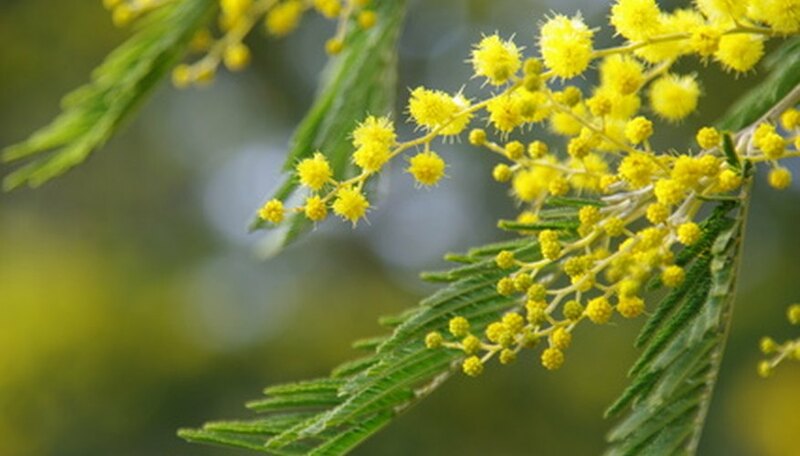 Three members of the genus Mimosa call the Rio Grande Valley home: honey mesquite, Texas ebony and Texas huisache. The honey mesquite (Prosopis glandulosa) usually grows between 20 and 30 feet tall with pale yellow flower-like spikes from March through November. A deciduous tree, it prefers full sun, and the wood often provides material for fence posts and barbecue pits. Texas ebony (Pithecellobium ebano) offers evergreen color with light-yellow flowers. The tree tolerates partial shade and the seedpods tend to litter the landscape. An interesting landscape tree because of its shape and rich color, the ebony provides nesting sites for birds and seeds for rodents and deer. Texas huisache (Acacia smallii) grows rapidly to its 15 to 30 foot height. The deciduous, gray-green leaflets provide complementary color and texture to other landscape plants. Trimming to the height of a tall shrub does not harm the tree and placed in a line can form an attractive hedge. An attractive flowering shrub that entices hummingbirds and butterflies, Texas lantana (Lantana horrida) has bright orange and yellow flowers and rich green foliage. The shrub typically grows to 3 to 4 feet tall in the Rio Grande Valley and flowers from March through November. It prefers full sun, but tolerates partial shade. The plants require little supplemental water or maintenance. Lantana is poisonous to livestock. Small barrel cactus (Thelocactus setispinus var. setaceus), also called fishhook or hedgehog cactus, produces light yellow flowers with red centers from February through fall in the Rio Grande Valley. These cacti grow throughout the Rio Grande Delta, usually in the shade of trees and shrubs. Morning sun and limited water provide optimum growing conditions. The fruit of the small barrel cactus feeds birds, small mammals and Texas tortoises. The small barrel cactus makes a nice addition to native landscapes and rocky trails. Too much water quickly kills this desert plant, however.